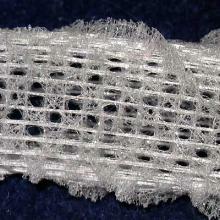 Marine sponge glass: photo by Art Oglesby; Glass structure formed by marine sponge. One approach to creating devices on a molecular scale is to have such devices self-assemble similar to the way living things "grow". David E. Morse is attempting to mimic how living organisms self-assemble complex shapes with nanoscale precision. The intricate glass structure pictured was assembled molecule by molecule by a species of marine sponge. The genes responsible for the glass structures encode for enzymes that serve as both a physical template for the structure and a catalyst for assembling molecular precursors into the desired material. Morse and his colleagues begin with a solution of molecular precursors. The researchers then expose the solution to ammonia vapor, which, as it slowly diffuses into the solution, acts as a catalyst. The physical template for the material is the surface of the solution. At this surface, where the vapor concentration is greatest, the material forms a thin film. "At first the crystals form at the [surface], but with time they begin to project down into the solution like stalactites growing down from the roof of a cave," Morse says. "What you end up with is a nanostructured thin film of semiconductor with very high surface area because of all the projecting thin plates or needles that project down into the solution. We are accessing structures that in some cases had never been achieved before. And in some cases we're discovering electronic properties that had never been known before for that class of materials," says Daniel Morse, professor of molecular genetics and biochemistry at UCSB, who led the project. The method works with a wide variety of materials. So far, he says, the group has made "30 different kinds of oxides, hydroxides, and phosphates." A list of selected publications by Morse. This is a link to a full picture of this sponge "glass skeleton" or go to Collector's Corner to see the real thing. I think this is a cool picture to see. i think that the picture is giving pancakes a very bad name!!!!!!!!!!! i love this article!!!! you should post more on biological topics.